Tickets are on sale NOW for the 10th Annual VCBW Festival June 8 & 9, 2019 at the PNE Fairgrounds in Vancouver. 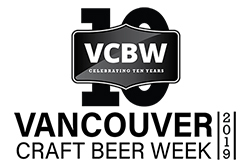 A limited number of weekend passes are available for the 2019 VCBW Festival. With your weekend pass you will get expedited entry to the festival on both days. Early entry to the VIP area – VIP ticket holders will be able to enter the VIP area and start sampling 30 mins before gates open to GA ticket holders. We’re looking forward to another awesome festival this year so be sure to get your tickets early to avoid missing out! Follow us on Facebook | Twitter | Instagram | vcbw.ca for updates and information on the VCBW Festival and Vancouver Craft Beer Week events! **Serving It Right Rules Apply. Please drink responsibly and be sure to plan for a safe way home! ***You must be 19+ to attend the VCBW Festival, 2 pieces of ID are required for entry. ****The VCBW Festival is a Safe Space. All of our volunteers, staff, and attendees should enjoy their experiences free from harassment, assault, or intimidation of any kind, any such behaviour such behaviour will not be tolerated.